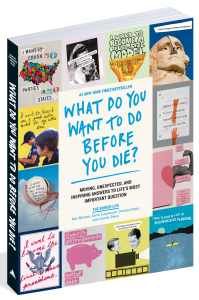 Ben Nemtin is the #1 New York Times bestselling author of What Do You Want To Do Before You Die? and the star of the MTV show, The Buried Life. In a pit of depression, Ben and his three best friends decided to create the world’s greatest bucket list to make them feel alive. They bought a rickety old bus and crisscrossed North America, achieving the unthinkable. And most importantly, every time they accomplished a dream, they helped a complete stranger cross something off their bucket list. From playing basketball with President Obama to streaking a professional soccer field, from raising over $400,000 for charity to placing a record-breaking $250,000 bet on roulette—Ben’s bucket list quest has inspired millions to chase their dreams and realize that impossible is possible. In today’s conversation, we talk about this remarkable journey, then we bring the conversation current and reveal the equally revelatory adventure Ben has been on in the year’s since his original sojourn into the world’s greatest bucket list.